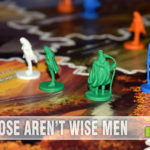 One of the side benefits we get from playing games themed in different industries is that we get an informal lesson about how their business works. When we played KanBan for the first time we gained insight into both the car industry and the Japanese method of management. Brew Crafters had us dreaming of running our own micro brewery, while Agricola puts us back out on the farm. Before we got involved in marketing for the toy & game industry 10 years ago, we were partners in a Los Angeles-based factory that manufactured plastic cards. I spent well over a decade looking at sheets of plastic come off our offset presses, and while I never took it upon myself to try and run one of those bus-sized beasts, I did become very good at assessing color. By heart I knew the base inks needed to formulate PMS 286 and how much Cyan could be pushed on the press to get those blues just a little more saturated. Dealing with Warm Gray 1 was a pain, since it would turn reddish when we applied a heat laminate to the sheet, and the trick to getting a nice solid black was to run it on two of the color units – something the industry called a double-bump. 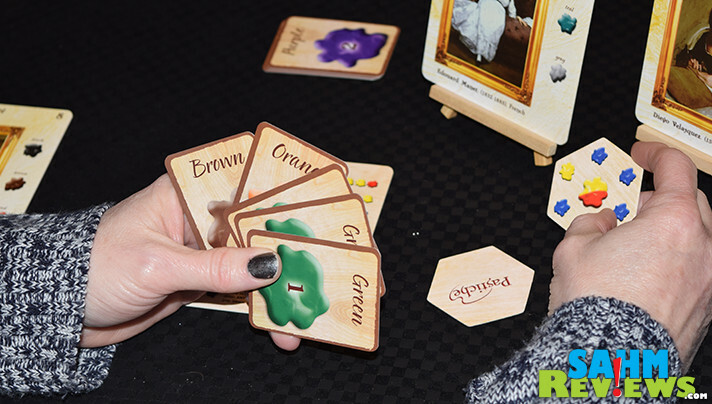 So when we first saw Petite Pastiche by Eagle-Gryphon Games and the fact it was all about mixing pigment-based paints, it felt as natural to me as breathing. 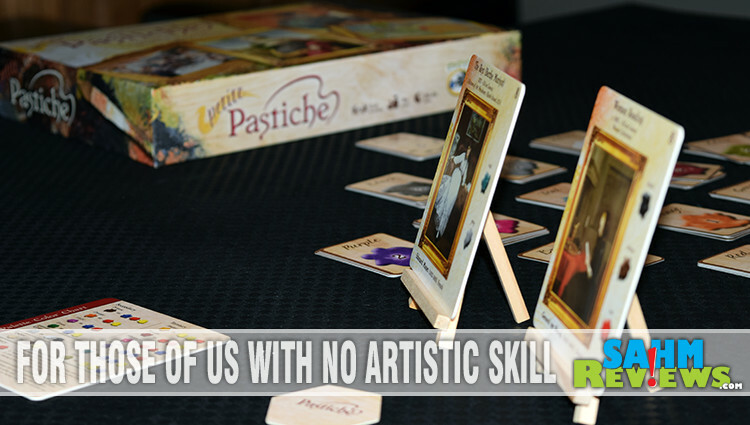 As you may have guessed, Petite Pastiche is a game about artwork. Licensed by the publishers, it includes 23 of the finest European and American art works from the past six centuries. Monet, Renoir, van Gogh, da Vinci, and Homer are but a few of the outstanding artists represented. And you get to paint them! Well, almost. You get to mix their paints. Imagine yourself an apprentice artist, learning from the masters. Before they’ll let you put paint to canvas, you must learn how to identify and create the right palette for the scene. Because you only have a limited number of colors at your disposal, mixing them in the correct proportions is key to generating the exact color needed by the master. But the other young apprentices are also doing the same, so efficiency and a little bit of luck are needed to earn the praise of your mentor. 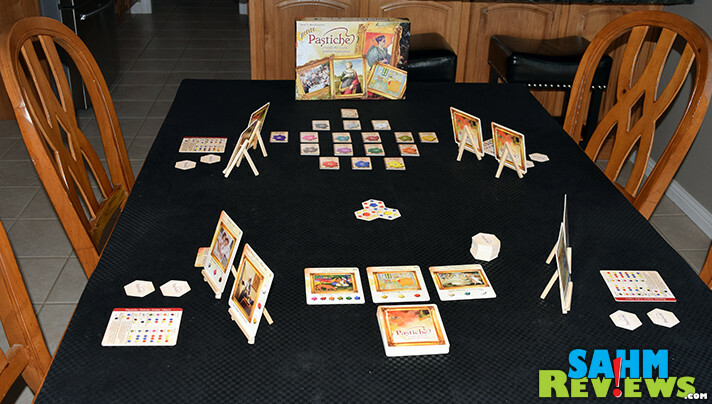 Petite Pastiche comes with 23 Commission Cards, 89 Palette Cards, 36 Palette Hexes, a special 3-Hex Starting Piece, reference cards and eight cute Wooden Easels to hold your Commission Cards. 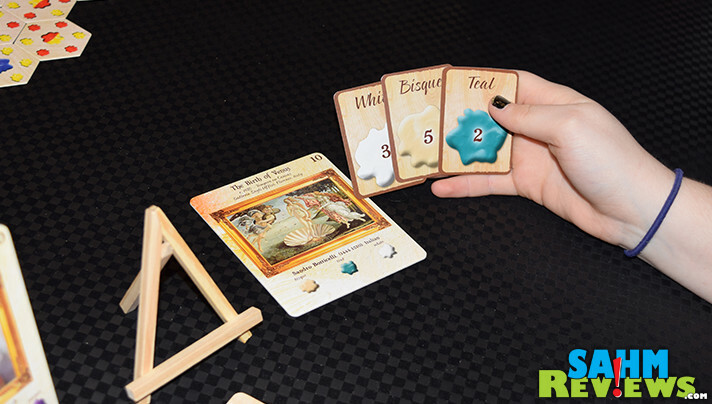 The Starting Piece is put in the center of the play area and each player is given (at random) two Commission Cards, which they keep secret. Two random Palette Hexes and one of each of the secondary color Palette Cards (green, violet, orange and brown) along with a reference card are also distributed to every artist. Your turn consists of three phases. 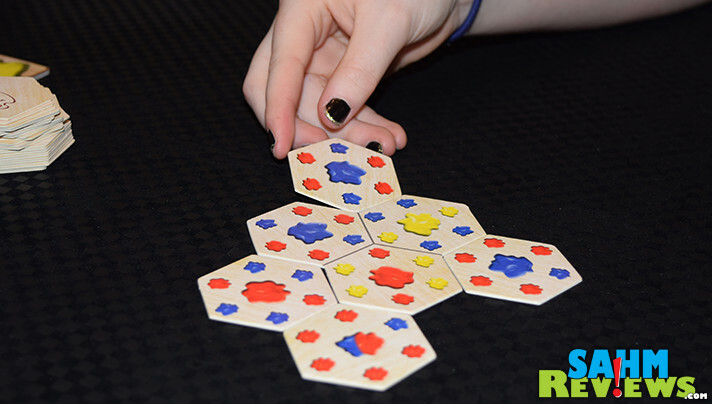 First you’ll place one of the two hexes in your hand adjacent to at least one side of a piece already on the board. Doing so lines up two or three dabs of paint. Using your reference cards you will look up what the mixture of those two or three colors make and take the corresponding Palette Card. If the combination isn’t listed, you take no card. Instead of mixing the inks, you may elect to simply take a card matching the primary color in the center of your tile. This limits how many cards you may collect, but is one of the only ways to obtain a primary color. The second phase is called the “Painting Phase”. During this part of your turn you may trade cards with other players or the bank, exchange Commission Cards with the gallery or complete them by turning in Palette Cards matching the requirements of the Commission Card in your hand or the gallery. Completing Commission Cards is the main way you will score in Petite Pastiche, with each piece of artwork having a value in the top right corner denoting victory points. Lastly, you’ll make sure you don’t have more than eight cards in your hand, discarding any more than that. Draw a new hex from the pile to replenish your hand back to two hexes and pass play on to the next player in clockwise order. 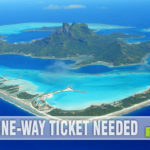 Play continues in this manner until one artist has completed commissions worth a total of 25/30/35 points (depending upon the number of players) and then the current round is completed. Cards remaining in player’s hands are not completely worthless. If they could be used on one of the Commission Cards in your hand, then you receive the number of points listed on the Palette Card. Add these values to your total Commission Card score and the player with the highest total wins Petite Pastiche! While recommended for 2-4 players aged 9+, we feel confident in recommending it for ages as young as six or seven. Not only is there educational value in learning about how colors combine to make new hues, the 23 Commission Cards depict actual artwork from some of the world’s most famous artists. Discussion about their painting styles and what you like/don’t like come natural in this game setting. We should note there is another version of this game entitled “Pastiche” by the same publisher. 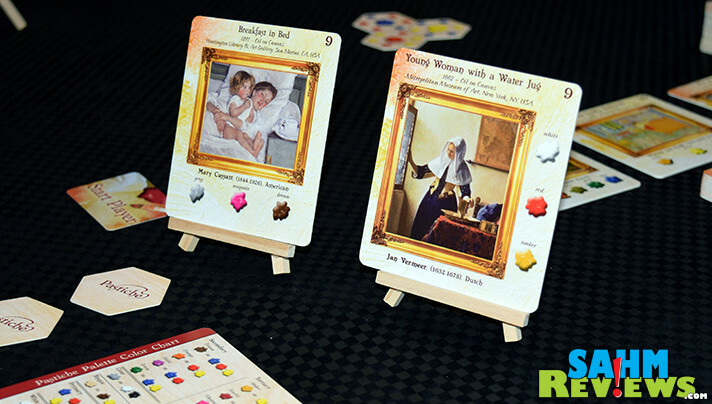 It is more-or-less the same exact game, but one or two of the pieces of art depicted may not be child-friendly. One small rule was omitted between the two versions (bonuses for collecting more than one piece of art by the same artist) so more artists could be included. Plus the Petite Pastiche version comes in at a much more attractive price point! With a MSRP of under $40, we think you’ll find both great entertainment and educational value in Petite Pastiche. 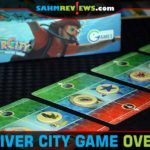 Grab a copy on Amazon or directly from Eagle-Gryphon Games on their website. Do you remember our on-going features about their E•G•G Series? They’ve recently announced a new title on their Facebook and Twitter timelines, so head over there to find out when it’s being released! Who is the real artist in your family? My oldest granddaughter would love this game, in fact I may get her one for Easter as I give each a game, outdoor toy or craft kit of some kind each year in lieu of candy or sweets. She is past the just drawing and wants to design from scratch. You always have the unique outside the box games! 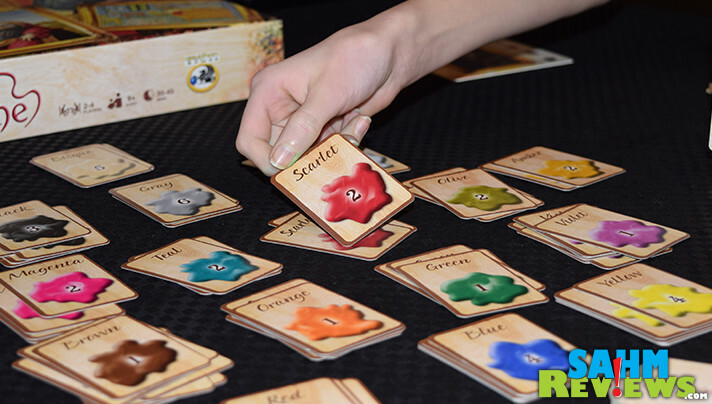 My kids love Eagle-Gryphon Games especiall the Island Hopper. They will love this Petite Pastiche Board Game for sure. I have to share this with them or maybe they should know already about this. I was all in with the artists and colors and then I got lost when you started explaining how to play. That’s typical though! LOL A lot of times it takes me actually playing the games hands-on before I figure it all out. Love that this is artist and color-oriented! 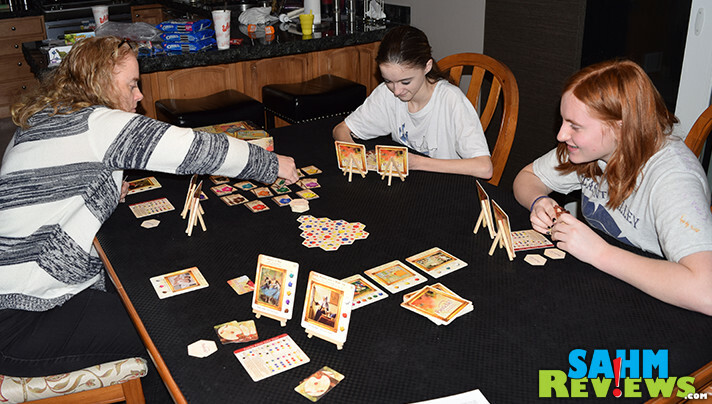 We love game night and this looks like it would be so fun. Anything to get the family together is great in my book! What an interesting concept for a game. I love how it incorporates painting the masters. This would be fun for gamers and art lovers. This looks like an intriguing game! Love the concept with painters. 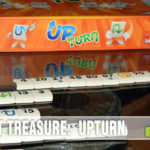 Too fun – I want to get it to play with my little brothers! Oh wow, this looks like such an interesting game. I would love to get my hands on this, that’s for sure.